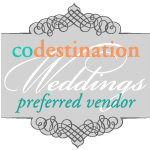 You are here: Home / Featured / Creating Classy and Unique Colorado Weddings and Receptions is What Amore’ DJ Entertainment Does Best – Especially for Destination Weddings! The Amore’ DJ Entertainment Wedding Entertainment Design™ process is specifically based on the planned and intentional discovery of you, your personalities, traditions, heritage, experiences, wedding day perceptions and expectations mirrored along side your wedding vision so we can help create a one-of-a-kind celebration. Then we are able to present suggestions based on our extensive wedding experience, creativity and knowledge to be able to do that. Together, we’ll create memorable and unique moments for the ceremony, and wedding reception using our extensive wedding experience to create meaningful and memorable moments, often times in areas or ways you may have never even considered, like a specific era in history. For example, a recent Texas A&M alumni couple (Blake and Lindsey) wanted to have a Colorado destination wedding in Estes Park at the gorgeous Della Terra Mountain Chateau nestled in Rocky Mountain National Park. We helped pull together a customized wedding celebration complete with a fun 1920’s flair, sprinkling in several Texas A&M wedding traditions to bring a little bit of them into their Colorado wedding. It was a day filled with so much fun, laughter, and smiles. It was truly awesome!